Esencia cigars were introduced in 2008 by Brothers of the Leaf, LLC, the same people who produce the fantastic Palio line of cigar cutters. A cursory search for information about this cigar produced only a few basic facts: it is a Nicaraguan puro made in Honduras. The blend is composed of Nicaraguan criollo and corojo. According to one website, the wrapper is Nicaraguan corojo; official sources can’t confirm that, but it sounds about right. The Esencia Corona Gorda is quite dark, weathered, and almost maduro in color. A discreet sheen of oil gives it a glint of seriousness. The roll is solid and the cap is well integrated, though not perfectly wound. Both samples drew well with a burn that was a bit jagged at times, but acceptable. 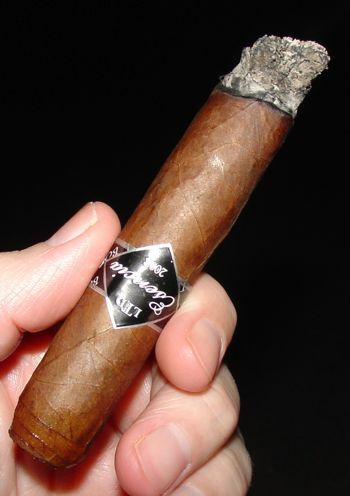 The ash is a dirty gray-black, very similar to what you get with an Illusione or many Padilla cigars. This swarthy Esencia cigar fires up woody and sweet, developing a rich flavor of hickory and pecan with some pepper on the tongue. The aroma is heavy, reminding me a little of resinous pine and cloves. The peppery element is toned down a little in the middle section and the woody flavors lose some of their sweetness on the palate. The smoke continues its sweet serenade on the nose, however, producing sensations of caramel and molasses. The flavor on the palate is slightly tannic, which balances nicely against the aroma. The final section of the Corona Gorda closes the circle and recapitulates its initial impressions of pepper and sharp spice. Towards the band the smoke becomes fairly aggressive, but taken slowly the smoke is still smooth and enjoyable. This is a medium-to-full bodied cigar, but fans of full bodied smokes will particularly enjoy the last section. Based on the flavor of the cigar, I would guess that there is some Aganorsa leaf in this blend, and if I had to guess where it’s made I would guess the Raices Cubanas factory. There is a definite resemblance to Illusione, Padilla, and Particulares (as well as other Casa Fernandez blends.) I may well be wrong, but that’s what my taste buds are telling me. If you enjoy that style of Nicaraguan smoke — crisp, spicy, and fairly complex — you will assuredly find this one enjoyable as well. If anything, the Esencia is a little bit smoother. 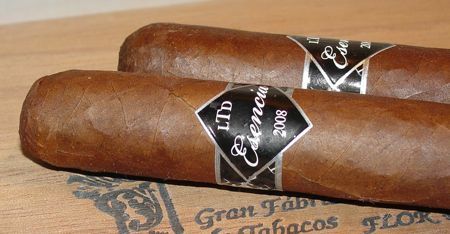 Unfortunately, the price is well over the century mark for a box — around USD 8.00 per stick for the corona gorda. Not the price I was hoping for, but certainly not unreasonable either, and in any case it’s money well spent. Another lovely, well-written review. Your love of language and cigars seem well matched. Question: Have you tried the new Aganorsa Leaf blend from CF? Have some on order and eager to get your take. Thanks for your comment, Keith. I haven’t tried the new Aganorsa Leaf blend — in fact, I just stumbled across it on a retail site while doing the research for this review. I haven’t heard anything about it so far, so I’d love to hear what you think! Well, I’ve only had one of the Aganorsa Leaf box press so far but really liked it. A torp. I’d say these are medium-full and start out with a pronounced cedar, turning more leathery and with a touch of sweetness on the finish. Pretty tasty and hopefully even better with a little rest. en este mundo tecnológico todo mundo es presentada el web? por favor me an la gente que creo que realmente disfrutar de apreciar su contenido.